Members of the ruling Lithuanian Farmers and Greens Union will collect signatures for a referendum to reduce the size of the parliament. The Central Electoral Commission registered on Thursday, January 10, an 18-strong initiative group for a binding referendum to amend the Constitution to cut the number of seats in the Seimas to 121, from the current 141 seats.The group has six months to collect at least 300,000 signatures of eligible voters for the referendum to be held. The LFGU notes that Lithuania currently has a population of 2.8 million, down from 3.7 million in 1992, when the Constitution, which sets the number of members of the Seimas at 141, was adopted.All previous referendum initiatives for cutting the size of the Seimas fell through. Security policy experts gathered in Lithuania on Thursday, January 10, for an annual Snow Meeting to discuss challenges faced by Europe and the United States. The participants of the two-day informal gathering included the foreign ministers of Ukraine, Slovakia and Latvia, and Ben Hodges, former commander of the United States Army Europe.A total of over 100 high-ranking diplomats, advisers, parliamentarians, experts from analytical and research centres, and international and security policy experts from about 15 countries and NATO and EU bodies attended the event in the district of Trakai in proximity of Vilnius. Lithuania’s military conscription lists for 2019 were drawn up at the Defence Ministry on Thursday, January 10. The lists, which were randomly generated by a computer program, include just over 31,000 men aged between 19 and 26 years. Some 3,827 of them will be actually called up for a nine-month military service this year. The Lithuanian government adopted on Wednesday, January 9, decisions opening the way for expanding the Pabradė training area to install new firing ranges and ensure better training of military units. The Cabinet approved a general development plan for a part of the eastern Švenčionys district municipality that allows more than doubling the total area of the Pabradė training grounds to almost 17514 hectares, from the current 8486 ha. Information provided by Lithuania’s Financial Crime Investigation Service (FNNT) regarding the UK-based startup Revolut’s activities causes concern, the chairman of the parliament’s Committee on Budget and Finance said on Thursday, January 10. Stasys Jakeliūnas, a Lithuanian MP, turned to FNTT and VSD on December 21, shortly after Revolut was issued with a specialised bank license by the central bank. Marius Jurgilas, a member of the central bank’s board, has said that Revolut poses no risks to customers, adding that, on the contrary, it helps increase competition. The Baltic countries are technically prepared to prevent a total power system blackout during Russia’s isolated operation test in its Baltic Sea exclave of Kaliningrad in May, Lithuanian Energy Minister Žygimantas Vaičiūnas said on Thursday, January 10. The efforts to ensure the energy autonomy of the Kaliningrad region sends two messages to the Baltic states, one of which is not to delay the process of synchronising their power grids with the continental European network, the minister said. The Baltic grids are still part of the post-Soviet BRELL ring, which also includes Russia and Belarus, and remain dependent on the control centre in Moscow and the Russian electricity system. Lithuania’s ambassador to Poland Eduardas Borisovas has presented his letters of credence to President Andrzej Duda, the Lithuanian Foreign Ministry said on Thursday, January 10. Following the ceremony, Borisovas laid a wreath at the Tomb of the Unknown Soldier in Warsaw and signed the memorial book. Prime Minister Saulius Skvernelis has nominated Algirdas Monkevičius, the 62-year-old rector of Mykolas Romeris University, for the position of education, science and sports minister.In her words, services are now performing necessary checks regarding the candidate. Bankruptcy proceedings for the financially-stricken Lithuanian airline Small Planet Airlines have been launched, with information from the Centre of Registers showing that Vilnius Regional Court initiated them on Monday, January 7. Small Planet Airlines CEO Kristijonas Kaikaris said the movewas aimed at securing protection from creditors as the company no longer received revenue after the Civil Aviation Administration suspended its license in late November. 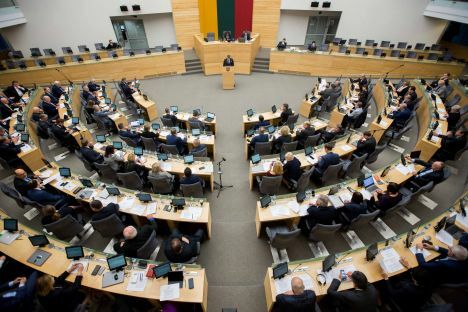 The regional court in Lithuania’s western port of Klaipėda on Tuesday, January 8, started hearing the case of a Lithuanian citizen, Roman Sesel, charged with spying for Russia.The court had decided to hold hearings behind closed doors, citing the need to protect state secrets. In December, the regional court extended Sesel’s detention until March 14. Lithuania’s Prosecutor General’s Office says Sesel collected information on Lithuania’s Navy, NATO military ships and military equipment they carried, the city of Klaipeda and the port’s infrastructure, including that having strategic importance for Lithuania’s national security. Ingrida Šimonyė, the conservative Homeland Union–Lithuanian Christian Democrats’ presidential candidate, has chosen Paulius Lukauskas, a former managing director of the government’s export promotion agency Enterprise Lithuania, to head her election campaign. Šimonytė presented her election team to reporters on Tuesday, January 8, describing them as people who are committed to Lithuania being a modern, democratic and Western country.The candidate said several hundred volunteers will help her during next May’s presidential election. Lithuanian businessman Gediminas Žiemelis has sold his shareholding in Moscow’s Zhukovsky Airport. He confirmed it on Tuesday, January 8. The businessman said his decision to exit the project was due to several factors, including pressure to reduce the volume of business in Russia.Avia Solutions Group, a Vilnius-based aviation business group controlled by Žiemelis, announced its exit from Moscow’s Zhukovsky Airport last October, but it did not comment at that time on his possible decisions. Rasa Kazėnienė, an official who disclosed irregularities in Lithuania’s prison system two years ago, has become the first person to obtain whistle-blower status and protection. The woman applied for whistle-blower status in an effort to stop litigation with Niklita, a company which sued her for alleged damage to its business reputation.Kazėnienė told the prosecutor’s office that Niklita had been granted exclusive conditions for commercial operations at the Kaunas Remand Prison. The prosecutors found her reports about possible abusive practices, stealing of funds and other offenses at the Kaunas Remand Prison to be correct.The Law on the Protection of Whistle-blowers, which was passed by the Seimas in 2017 and came into force from the new year.